This collection of articles from the Indianapolis News for May 25, 1911 provides some interesting sidelights to activities at the Indianapolis Motor Speedway leading up to the first Indianapolis 500. Indianapolis Mayor Samuel Lewis Shank called for the opening of a municipal building to be used as sleep quarters for out-of-town guests as hotel capacity had maxed-out prior to race day. Also, the Speedway's original plan for Wild Bob Burman to make a mile record run on his Blitzen Benz on race day morning was scuttled when other manufacturers objected that it would detract from the focus of the main event to showcase their machines. The date was moved to the day before the first Indianapolis 500 and all proceeds were directed to benefit a local hospital. Another article reports on what they called "tuning day" at the Speedway as teams prepared their entries for time trials. The Amplex team suffered a setback when driver Joe Horan and riding mechanic Emmett Ward were injured in an accident. This was not the first accident for the car, which developed a bad luck "hoodoo" reputation. 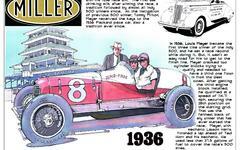 Nonetheless the well regarded driver Art Greiner signed on to drive for the race. A final article talks about police plans to route traffic to avoid congestion in the city.